Is it pronounced Rendar Fi, like Fly, or Rendar Fee, like Free? Specters of Aldorn can move through all figures and are never attacked when leaving an engagement. 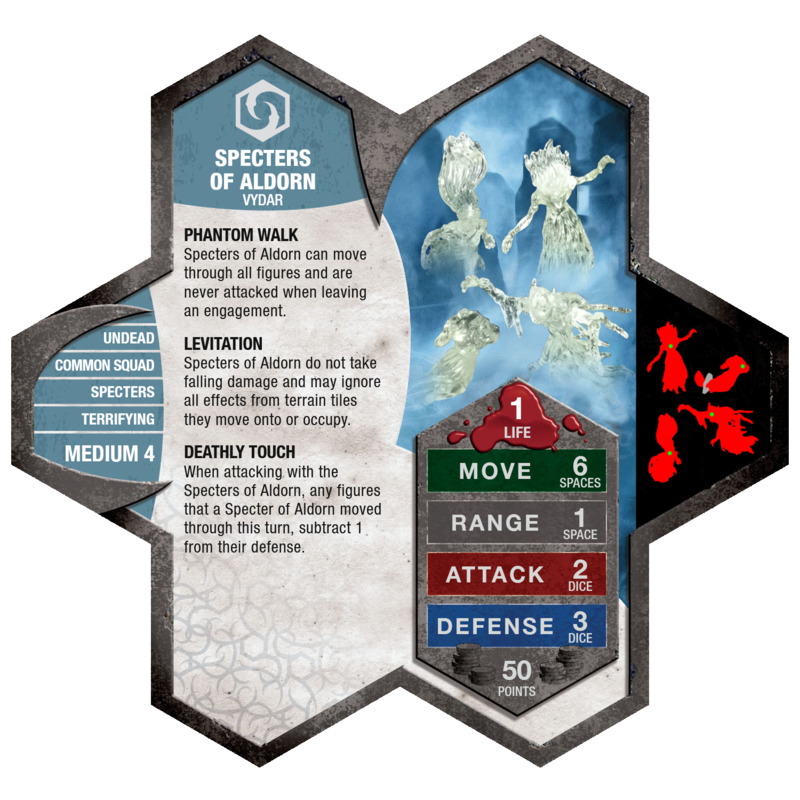 Specters of Aldorn do not take falling damage and may ignore all effects from terrain tiles they move onto or occupy. When attacking with the Specters of Aldorn, any figures that a Specter of Aldorn moved through this turn, subtract 1 from their defense. Balance/Playability- The specters are a bit tricky to play, which fits well with Vydar. They don't hit very hard, and against the wrong army, they fall pretty fast, but when positioned well, they can feel great. Phantom Walk gives them the mobility they need to be effective, and Deathly Touch compensates for their low attack. Their threat range is 6, but they are most effective when their enemy is within 4, so that they can pass through, and activate Deathly Touch. Creativity/Theme- Vydar's army already has the undead mummies, and now he has opened his ranks to the Specters of Aldorn. The specters are the embodiment of a spooky spirit, that has come to haunt, or scare the enemy. The combination of powers allows them to move through figures, and deathly touch seals the ghostly theme. I think it's a little funny that none of the existing phantom/ghost-like cards in heroscape, or the C3V/SoV, use the Phantom Walk ability, despite the name. The figures used for the Specters are from the Nolzur's Marvelous Unpainted Miniatures "Ghost & Banshee" and "Wraith & Specter" sets, which are currently in production from Wizkids. Last edited by Leaf_It; September 25th, 2018 at 08:39 PM.